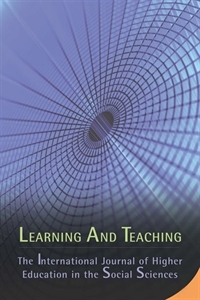 Learning and Teaching (LATISS) is a peer-reviewed journal that uses the social sciences to reflect critically on learning and teaching in the changing context of higher education. The journal invites students and staff to explore their education practices in the light of changes in their institutions, national higher education policies, the strategies of international agencies and developments associated with the so-called international knowledge economy. The disciplines covered include politics and international relations, anthropology, sociology, criminology, social policy, cultural studies and educational studies. Recent topics include curriculum innovation, students academic writing, PhD research ethics, neo-liberalism and academic identity, and marketisation of higher education. The readership spans practitioners, researchers and students. It includes undergraduates and postgraduates interested in analysing their experience at university, newly appointed staff taking a qualification in learning and teaching, staff of learning and teaching units, experienced teachers in higher education and researchers on university reform.